Advanced Techniques Tutorials by Smooth-On, Inc. The next step in moldmaking. These videos and step-by-step tutorials show techniques which are for advanced users and include cavity molds, multi-part molds, and other ways to mold complicated originals. 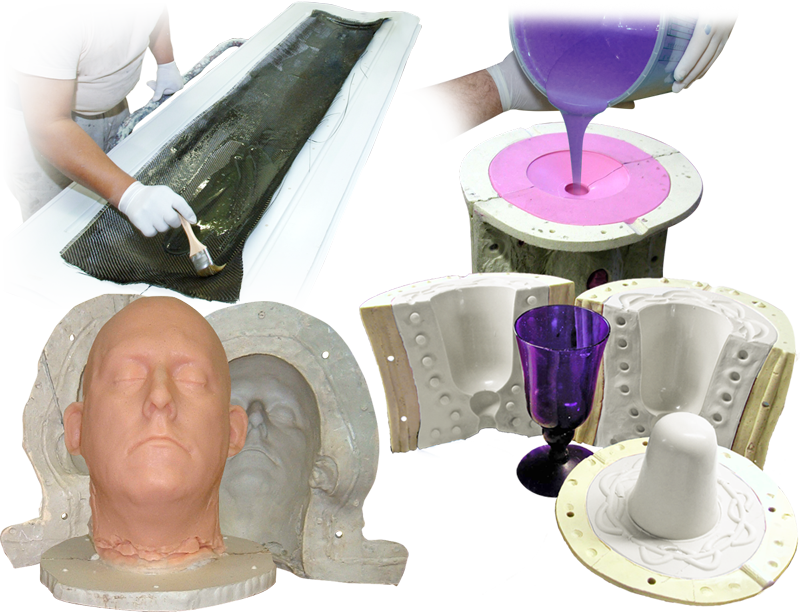 Whether you are interested in reproducing a sculpted figure, an antique picture frame, an industrial pattern, an architectural molding, a fossil, animal skin (taxidermy), the texture of a piece of fabric, or a toy, you start by making a rubber mold. Whether you want to make one or one thousand reproductions of an original, you can do it using a mold. Whether your original model is made from clay, wax, plaster, sand, concrete, stone, metal, bone or almost any material, making a rubber mold makes it possible to reproduce that model – exactly. The extreme flexibility of Dragon Skin makes it ideal for creating one piece glove molds. Smooth-Cast® 65D is used in a rotocasting machine to create full-sized display heads which only weigh 2 lbs. (0.9 kgs) each. Molding and casting a piece with delicate detail, complex angles and severe undercuts. Using EZ-Spray silicone rubber to coat a degraded steel plate - eliminating a costly repair. Dragon Skin® is excellent for brush on molds. A Dragon Skin® mold can be turned completely inside out without risk of tearing. This sequence chronicles Mr. Ross's process in successfully reproducing this model using an advanced mold making technique. One of the most common questions we're asked is how to create a mold from an original model that has a pass-through. This mold making tutorial video demonstrates how Mold Star 16 FAST silicone can be used to take forensic impression evidence. For over 40 years, Tim Bennett's hobby has always been treasure hunting at garage and yard sales. In this step-by-step photo gallery, a 2-part rubber mold is made to duplicate an industrial wheel. The process of creating a very high accuracy silicone mold using platinum cure silicone. This tutorial shows how a seamless mold can be made using Dragon Skin™ 10 NV silicone rubber. This tutorial shows how to make a one piece silicone mold out of a transparent silicone. How Plasti-Paste™ EPOXY can be used to make a support shell for a brush mold.